Lots of folks have been asking, so for anyone that hasn't heard: Berndt was hurt at the Makapuu LZ on Friday, and is at Queen's now, awaiting back surgery. He would appreciate visitors - he's stuck on his back with nothing but his morphine button for entertainment. I know he'd appreciate it if anyone could stop by to chat; he's in room 562. Let's keep him in our thoughts during the days ahead. Hang in there, Berndt! See comments for updates on his progress. Today I visited Berndt at Queens. He was pretty bored watching the usual TV, so I brought him some pre-op goodies. After a brief visit to the hospital Alex went to Berndt's boat and brought back his books, reading glasses, and clean clothes (which won't be needed for a while). He is now off of Morphine as the pain has sub-sided in his back. Berndt is luckier than I, and yet still unlucky. I severely injured my back and I was in extreme pain for 3+ weeks on a cocktail of Morphine & Demerol, m mm yum. Berndt will still require surgery for he has some damage to the L-4 & another disk, with pressure on his spinal cord. So surgery is a must. 18 years ago I too had to undergo emergency surgery. Back then it was considered experimental? Berndt joins an elite club of broke backs- Myself, Motorhead Paul, and Sub-Steve.. Myself and Sub-Steve are strong again. Paul can still out-wrangle a much younger drunk, and Steve is 100%. So, there is good chance that with time and care Berndt will be soaring again. Here's what Berndt is really gonna need - He lives on a small sailboat in Keehi lagoon. So, the reality of getting around on his boat after surgery is not good. If anyone has a spare room, for Berndt to rent & recoup in, that is what is really needed...? With surgery slated for sometime Tuesday visiting will be limited for tomorrow, and then he'll need a few days to recover. The surgery is extremely painful, so he won't be much fun for days after. If you know what I mean. I'm not exactly a proud member, but I also belong to the Broken Back Club. 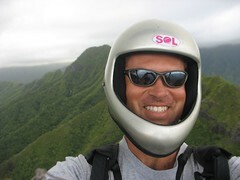 It happened at Makapuu when I first started flying - fractured 2 vertebrae (and broken ankle and cracked a couple ribs). Luckily - I didn't require surgery for my back (just the ankle), I have a desk job, and I had my wife to help me out. I know it's a tough recovery, and my best wishes are for Berendt to make a full recovery and join us in the air once again. BUT, if there's any one bit of advice I could pass on to Berndt, it would be to not rush his recovery time or to "push it" once he feels better. Just when I started to feel normal again, my wife and I moved to Waianae. While moving furniture (dumb! ), I tweaked my back real bad and developed a crippling sciatica pain that made my original injury feel downright pleasant by comparison. It turned my 2-3 month recovery into a 6+ month one. PLEASE, set up not to overshoot. the LZ is loooonnngg, specially on east days (90+% of the flying days). It is OK to land short. He's nervous as hell about the surgery tomorrow, can you blame him? He should be recovered enough by Wed for phone calls/visits, so let's make sure to check in on him. He doesn't remember too much about the accident. Joey and I will have to fill him in when he's up for it.